Welcome to Crash Course - the revision aid to get you the results you need! "Crash Course" is a complete revision guide designed specifically to save you time by providing everything you could be asked in the exam in one place! Each book in the series has been specially written either by senior medical students or junior doctors carefully supervised by faculty advisors to ensure that it exactly matches your needs by having been prepared by someone who has just been in the exam situation! 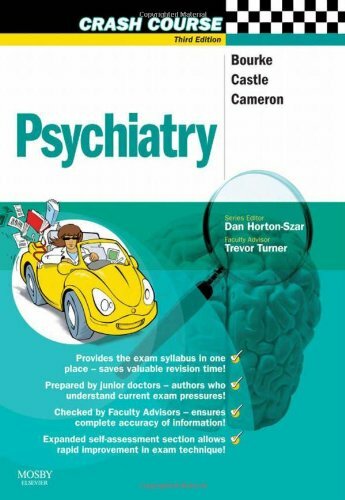 Fully updated with improved layout, the first part of this volume addresses the clinical presentations in psychiatry while the second part examines common psychiatric disorders, all in a memorable, easy-to-understand format.The third part covers clinical assessment and psychiatric management providing all of the facts you need to get things right. Additional new features include Learning Objectives at the start of each chapter, improved Hints and Tips boxes, Communication boxes and a completely revised self-assessment section tailored to current exam needs. "Crash Course" is an easier way to get through the exam! Julius Bourke is currently a Senior House Officer on the East London and the City psychiatry rotation, where he works in general adult and transcultural psychiatry, liaison psychiatry, intensive care, child and adolescent mental health, and assertive outreach and mental health for older people. Dr Bourke's principle interests lie in liaison psychiatry and neuropsychiatry, including the psychiatry of epilepsy and psychiatric applications of neuroimaging. He is an Inceptor of the Royal College of Psychiatrists, a member of The College's Special Interest Group in Neuropsychiatry (SIGN), the Trainees and New Consultants Group in Liaison Psychiatry and is a Young Fellow of The Royal Society of Medicine. Since graduating, Dr Bourke has also worked in Accident and Emergency, Neurology and abroad in Hyperbaric Medicine. He has passed part one of the MRCP and the MRCPsych examinations. His personal interests lie in photography, diving, waterskiing, music and travel.